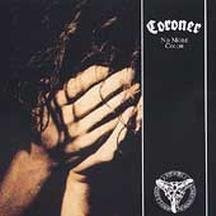 Stay Right Here a Little While...: CORONER'S "NO MORE COLOR"
Coroner are a highly innovative progressive thrash/speed metal band that peaked in the late '80's/early '90's. Their sound is vicious and heavy, with blazing tempos, bizarre chords and tunings, and desperate, lost in a vortex vocals. Their music gives you the feeling of being lost in a cold, mechanical world that is spinning out of control. Their influence is far reaching. It is especially heard in the music of industrial metal bands Ministry and Skrew. Their best album is "No More Color". It is a stark, pleading piece of desperation and hopelessness. From beginning to end it punishes you, with songs such as "No Need to Be Human" and "Tunnel of Pain". You will not walk away from this album in a better mood, but you will want to come back for more again and again. Coroner was one of those bands that pushed metal outside of it's limits, almost into the realm of art-rock. They were too strange to make it big in the thriving metal scene of their time. They sustained themselves throughout their career on a small but loyal cult following. Give "No More Color" a try. You won't be disappointed. Here's "Read My Scars" and "Die By My Hand" from "No More Color".